Dates, you think. You stare at the mushy, brown, wrinkled fruit and scrunch up your nose. Putting it in your mouth, you chew quickly, gazing all the while at the array of food in front of you. 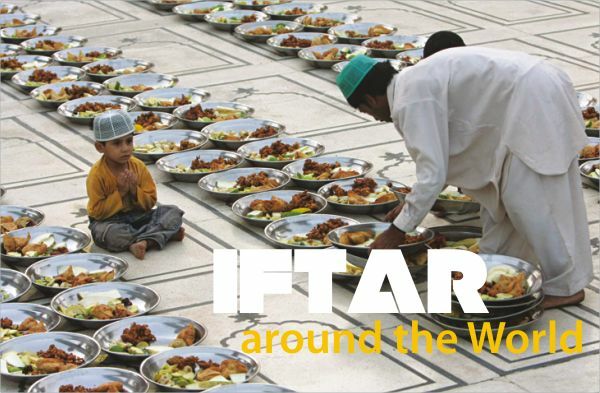 You imagine thousands of other Muslims around the world (at least the kids) going through the same ordeal every iftar and sigh in sympathy. Your date seems stuck in your mouth and you quickly swallow some lemonade to wash it down. Staring with gratitude at the glass in front of you, you utter a quick prayer for those other kids so that they might have something to swallow their dates with. In Indonesia, the kids are too busy swallowing their dates with dessert. They gaze adoringly at their cendol - coconut milk, rice and shaved ice. In fact, loads of Indonesian iftar dishes have coconut - kolak, which has jackfruit or banana stewed in coconut milk and palm sugar; bubur kampiun, sticky rice and sweets in coconut milk; and pallu butung (banana and rice in coconut milk). The highlight though is their steamed multilayered cake - kue lapis. In many places, soup is abundant. 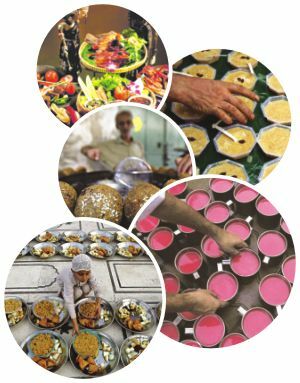 While Indonesians have their sop bua (a fruit soup with jelly and condensed milk) and Malaysians their laksa (spicy noodle soup), Moroccans prefer Harira, containing tomatoes and lentils. Served with honeyed cake-like chebakia and lemon wedges, the Harira is sometimes used to break their fast. Your indignation at this injustice is further aggravated when you realise that the chebakia is actually a cookie and that meat pies make a frequent appearance on their iftar table. In fact, in Tamil Nadu and Kerala, some Muslims break their fast with nonbu kanji which is rice cooked with meat and vegetables. In Uttar and Madhya Pradesh, they follow our custom more closely, with samosas and pakodas for Iftar. On the other side of India, Pakistanis aren't too creative either. Other than the typical jilapi and chicken rolls, they have Shami Kebabs and fruit salads to even things out. In Russia, instead of lemonade, they have kvass which is a fermented drink made from rye bread, but apparently falls into the non-alcoholic category due to its low alcohol content. To go with their kvass, they have dumplings called khinkali and beshbarmak which is, oddly enough, Kyrgyzstan's national dish. Turkey makes a mean iftar, complete with courses. With soups and appetisers including Turkish Pide Bread made only during Ramadan, they even have dessert (called gullac) after their main course. Other places around the world fall back on fast food, pizza and pasta. In Egypt, they have kunafa which is an angel-hair type of pasta. In Italy, they have plain old Italian Bolognese. Mexicans break their fast with tacos but hey, we have our fried beguni and piyaji right? This chain of thought inevitably leads you to wonder about the variety on the iftar tables around the country. In northern Bengal, they don't just have your typical muri. They fry it, soak it, mix it with shorishar tel, onions and chilli and eat that. Kind of like jhaal muri... In most places, they serve sweets that are local to that region. In Jashar, different types of shondesh are often served with iftar. Similarly, in Dinajpur they have naru and maowa (muri just keeps cropping up, doesn't it? ); it's stuff we see all the time, just not at the iftar table. Something that seems to appear on iftar tables at different places is khichuri. Some people think it's weird, others think it is normal; most people think it's unusual but okay as long as it's not dheela khichuri, except Sylhetis; they love their dheela khichuri. In St. Martin, fish is much more common, as expected. They have wontons and daaber paani instead of lemonade. The most variety happens to be right at our doorstep... 3 hours of traffic away. It's Old Dhaka. From kebabs to chicken or beef roast, borhani, matha and the infamous Boro baper polay khay (a mixture of chickpeas, brains, minced meat, potatoes, chira, eggs, chicken, 13 spices and ghee), Chawkbazaar is definitely a special place to go for iftar. Tehari is pretty common too and apparently Dhakaiyans have a specialty called muri bhorta (yes, muri again). Maybe there's a reason the muri keeps turning up in all the dishes. You contemplate the idea for awhile before the light bulb turns on in your head. Like so many Bangladeshi kids before you, you realise the potential of the muri. Casually looking around, you shove the date under your pile. I guess we Bangladeshis have it better off after all; I mean, imagine the poor Italian kids trying to hide their date under the pasta.